I shutdown Website A after making a decision to declutter my portfolio. The website was making a good revenue because it was teaching people to make additional income. I spent a lot of time researching and writing the articles so I didn’t want to discard them. Apart from this, I wanted to continue helping some people who are really interesting in creating multiple channels of income. I shifted the articles to Website B and did a 301 Permanent Redirect to the new home. Turned out that I should make more effort than this. It seemed like Google has detected redirect loops (I shifted the links from Website B to Website A and now shifting back to Website B). I also forgot to update the images and links on Website B after I shifted the articles. This caused my ranking to drop slightly, which affected my organic traffic to the website. I thought it would be a temporary issue because that’s what happened when I shifted from Website B to Website A. I disregarded the issue and let it be. After a few weeks, I decided to shutdown Website A for good without checking that some of the links on Google are still directing to Website . When I removed my server from DigitalOcean, the whole ranking collapsed. 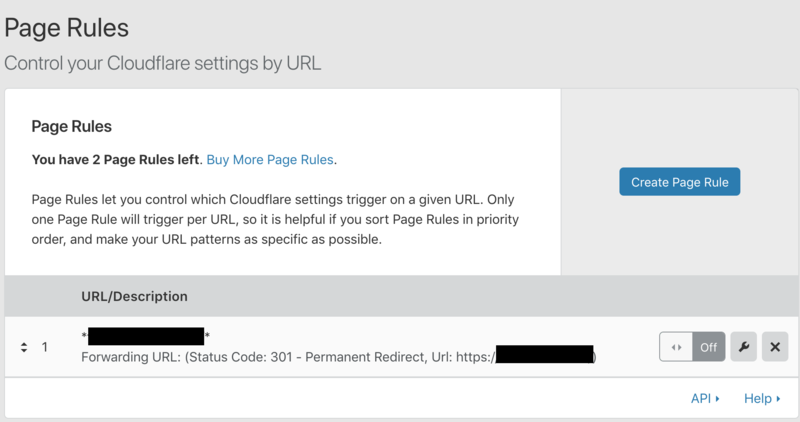 Well, I didn’t know what I should do next… but wanted to salvage the situation so I redirected other links to Website B using Cloudflare Page Rules. This did not help the situation. In fact, it worsens the situation as those links that had already redirected are now directing to the homepage. It’s as good as going back to square one now. Oh well, that’s why people say that internet ranking is really brittle. All I did is to shift my articles and I broke my entire traffic. Hah, this is indeed a mistake learned in the hard way! I guess the right way to do it - is to properly shift the articles and update all the images and links to the new website. We should only shut down the server when the links on Google are definitely forward to the new website. Well, the good thing is that I have decided to declutter my portfolio. Hence, it’s perfectly fine since I no longer need Website B to earn any good money. I was holding onto Website B because it holds a set of stories that I want to keep as my memory.